A working group on employment may be formed in 2019 as a follow on from this event. 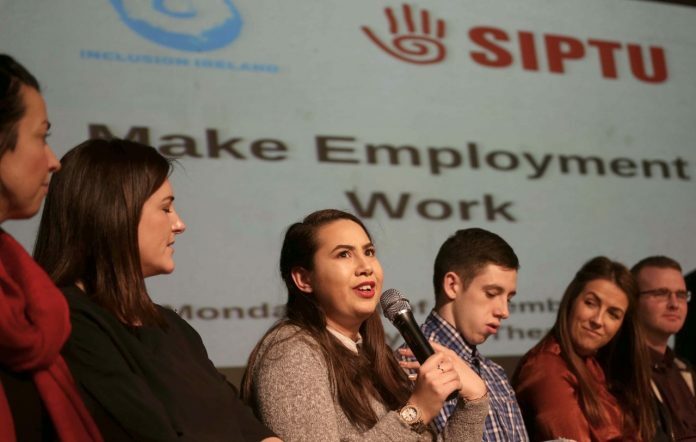 On the 3rd of December 2018, the International Day of Persons with Disabilities, Inclusion Ireland hosted an event sponsored by the Services Industrial Professional and Technical Union (SIPTU) at Liberty Hall, Dublin. The event, called Make Employment Work: Supporting People with Intellectual Disabilities in Employment was attended by over 200 people, the majority of whom have lived experience of intellectual disability, along with their supporters, support workers and professionals. Make Employment Work was organised by the Self-Advocacy Subcommittee of the Board of Inclusion Ireland. This Subcommittee is made up completely of people who have an intellectual disability. The subcommittee decided early on in the year that they would like an event to explore one of the biggest issues facing people with intellectual disabilities – the issue of employment. As it stands, only 17% of people with an intellectual disability are in employment in Ireland, and 26% of people with disabilities are experiencing consistent poverty, according to the CSO. What these statistics show is that as Ireland approaches “full employment”, a large section of the population has yet to reap the benefits of the growing economy. There are many reasons why people with intellectual disabilities struggle to get a job. These include inaccessible transport, the lack of careers guidance in special education, the higher costs associated with having a disability, societal stigma and the lack of proper employment supports. In choosing to host an event on employment, the subcommittee decided it was important that people heard these experiences straight from people with lived experience. The aim was for this event to be a platform where people can share their experiences of employment, both positive and negative, with their peers, and to have a discussion about what can be done moving forward. Since the beginning of 2018, the Subcommittee was involved in organising all aspects of this event. This involved deciding on what the event will look like, who was to attend, the venue and what kind of presenters were to be involved. Early on in the year Inclusion Ireland made contact with SIPTU, who offered to sponsor the event with Liberty Hall as the venue. The Subcommittee felt there would be no better way to mark International Day than in Liberty Hall with all its history of employment rights in Ireland. In keeping with this participative approach, Inclusion Ireland posted online asking for people to apply to present at the event. The Subcommittee felt it was important the event had participation from different types of people from around the country. At the event itself on the 3rd of December, there were 8 presentations and the event was hosted throughout by people with an intellectual disability. The presentations included the WALK Advance Programme. This involved hearing from Kathryn Griffin who talked of her journey for the past 13 years looking for a job to recently starting as a receptionist in WALK. Ziad talked of how he started his own business as a DJ in bars in Dublin. The event also heard from Geraldine Scanlon who talked about her PASTE research on those transitioning through school and how more supports are needed for people to go on to third level education. Emily Healy talked of her job in the Mayor’s office in South Dublin County Council and how having a job has helped her become more independent, with her living in her own home and being more involved in her community. The Ability @ Work Programme from Cope Foundation in Cork involved hearing from Mikey, Amy and Kenneth on their experiences of trying to get a job and the different approaches each of them are taking. Tomas Murphy spoke about the different work experiences he has had and how his perseverance with his employer in A&L Goodbody led to him being offered a permanent job with the company. Margaret Turley spoke of her job in EY, the positive effects having a job has had on her independence, and the importance of the social aspect of being in a working environment. Michelle Quinn from SIPTU also spoke about the role of trade unions in promoting the rights of people with disabilities, and the challenges people with disabilities face. The event was closed by Fergus Finlay, the Independent Chairperson of the Comprehensive Employment Strategy Implementation Group. Fergus spoke about the need for more to be done in addressing the barriers people with disabilities face in trying to get a job. The event was very enjoyable for all who attended. People felt energised by the discussions throughout the day and there was interest in continuing the learning from the event with a potential working group on employment being formed in 2019. Robert Murtagh (Inclusion Ireland) is an Advocacy Project Worker with Inclusion Ireland’s Communications and Information Team. Robert assists in facilitating Inclusion Ireland’s Self-Advocacy Subcommittee. Robert has previously worked in various roles in disability services. Robert holds an MSc in Equality Studies and a BSc in Psychology through Science and a Professional Diploma in Human Rights and Equality.